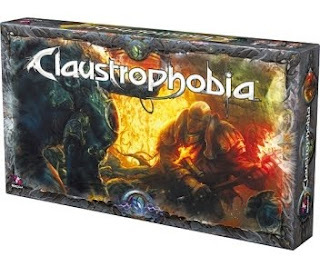 Claustrophobia is a board game that takes place in the world of Helldorado, which is a miniatures game where humanity decides to invade Hell in a land grab that is epic in its shortsightedness. You know you're in trouble when you need land so bad, you decide to move to Hell. Sure, you can get property really cheap, but you know it's going to be in a horrible school district, and odds are, taxes are way steeper than they have any right to be. And if you think it's bad for your home value when someone builds a parking lot next door, how much worse would it be if you're located next to a portal to Satan's Pawn Shop? In Claustrophobia, the demons (you know, the guys who actually live in Hell, and are probably a little bit ticked that someone has decided to put a lean-to on their manicured front lawn) inhabit tunnels and caves under the city of New Jerusalem, and they're making life a little rough for the humans above. That's only fair - New Jerusalem takes up space the demons used to use for a hellhound park. But the humans are dead set on hanging onto the land, despite the fact that even lake-front property is unpleasant (probably because the lake is on fire). So the humans recruit a redeemer - a holy warrior with serious power against the forces of evil - and give him a handful of condemned prisoners to go with him into the uncomfortably balmy caverns underneath the city. To stop the redeemer and his gang of misfits, the demons are going to send hordes of troglodytes - Hell's answer to cheap labor - and maybe the odd uberdemon with exceptional skill at snacking on people. So basically, this is a dungeon crawl. The map is composed of beautifully illustrated tiles depicting the twisting, narrow caverns that wind just beneath the surface of Satan's Playground. All the combatants are really cool pre-painted plastic miniatures, and they look fantastic. Sure, there are only five different sculpts, but there are 17 figures in the box, and they're all cool (though it is worth mentioning that the troglodytes look like that dog alien from Lilo and Stitch). To depict the various equipment and abilities of the various warriors, you've also got a few different decks of cards, all with stunning art. Basically, the production values for this game are completely off the scale. It's not quite as jaw-dropping a Space Hulk, but it also doesn't cost $100. There's a ton of value in this box. There's also a superb game in this box. One really cool mechanic is how you assign abilities to every human at the beginning of the game - you roll some dice, which go into a little slot on the human character cards and match up to one of six slots each human has. Depending on the assigned dice, a human character might be defensive, offensive, or fast, and maybe have some cool ability he can use that turn. When humans take wounds, they plug one of those action slots, which has two effects. First, if you have to assign a die to a slot with a wound on it, that character is going to spend the turn gasping for air and feeling his wounds, and can't move or attack. And second, when all six slots are gone, the human in question is just dead (and depending on his life choices, his soul may not have very far to travel). Combat is a simple die roll, and movement is as easy as moving a figure from one tile to the next. But there are still several important tactical maneuvers in every round, and there's a fantastic amount of depth for a game whose rules are as simple as these are. If you don't practice some intelligent strategy, planning for the long haul and making the right move when you need it, your characters will probably wind up becoming permanent residents, instead of just owning a timeshare. Claustrophobia is a pretty clear example of a kind of game we see a lot recently. It's got all the classic markings of a quantity versus quality game, where the humans are skilled fighters and the demons come in droves. It has a heck of a lot in common with Space Hulk, except this is a fantasy dungeon crawl in Hell and Space Hulk is a sci-fi dungeon crawl on a space ship. If you enjoy this kind of game, Claustrophobia should be a no-brainer. And despite there being a lot of similarities, the two games are also very different, so there's no reason not to own them both (you know, unless you're not rich). The only real problem I have with Claustrophobia is a question of theme. While the game play is fast and fun, and I definitely have a dungeon-crawling vibe from the game, it doesn't really deliver on the 'Hell Ain't a Bad Place To Be' storyline. I might have been in a cavern in Hell, or might have been fighting goblins in the mountain caverns. The troglodytes are not particularly demonic in appearance, and could just as easily have been kobolds lead by a particularly ferocious bugbear. The game is stunning, and tons of fun, and I'm more than willing to overlook the theme issue - but just because I'm giving it a pass doesn't mean it's not there. If you're a fan of dungeon crawl games, and you like your eye candy as much as I do, Claustrophobia should probably be on your 'man, I should have asked for that for Christmas' list. I think it's a hoot, and I'm looking forward to playing it again, even if I do still wonder what the commute must be like if you live in a suburb in Hell. Piss on you for HAVING this game, Drake! You always get the cool kid's stuff before anyone else! I guess that's tempered by all the Atlanteons of the world that the pus-peddlers try to pawn off as games, though. Next time I'm in town, you'll have to invite me over for a game!